If you’re guilty of paying close attention to what you eat before and during your run (for energy and to avoid emergency bathroom breaks of course), but scavenge your pantry after a run, reaching for anything that will satisfy your runger, this is the article for you. Because post-workout nutrition is a key part of recovery from (and preparation for your next) run. This window of time immediately post-workout is a great time to replenish muscle glycogen stores, rehydrated, and start to stop inflammation in its tracks. The best way to replenish muscle glycogen is with a 4-to-1 ratio of carbs-to-protein immediately after a workout.1 You can start to get rehydrated by drinking electrolyte-enriched water. Foods rich in antioxidants will help your body start to manage the inflammation that has been created from your run. Once your muscle glycogen has been replenished, your body can turn its attention to repairing and building muscle tissue. High quality, complete protein sources are the best way to support this. Foods that are rich in amino acids arginine, lysine, glutamine and BCAAs are especially important for recovery. 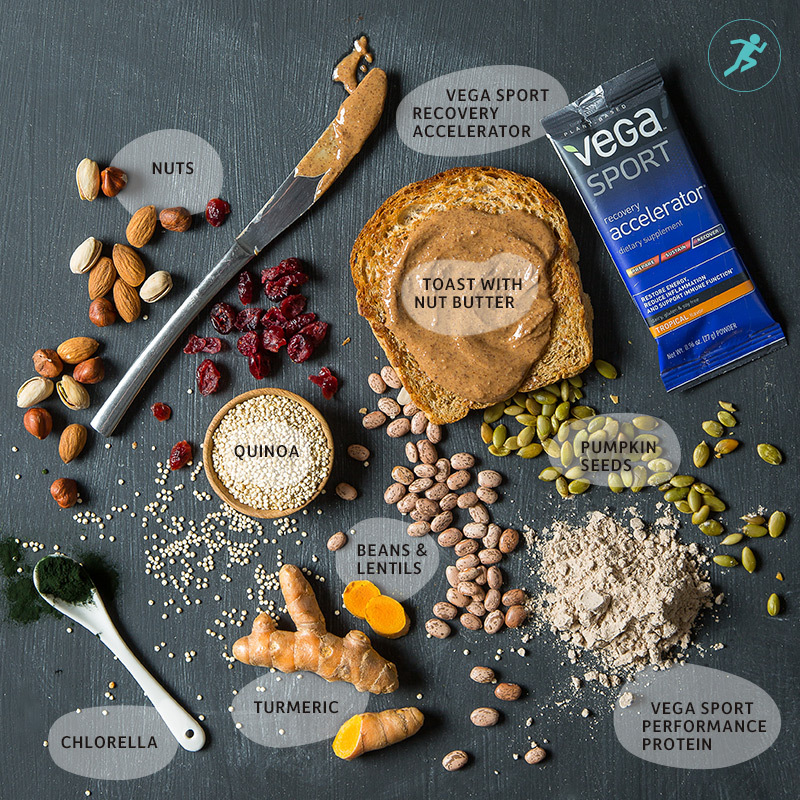 Vega Sport® Recovery helps replenish glycogen stores, making it an ideal follow-up to your workout. Curious about ways to eat a 4-to-1 ratio of complex carbs to protein? Try a piece of gluten-free or sprouted whole grain bread with a tablespoon of nut butter for another tasty way to replenish muscle glycogen. On-the-go and forgot your Vega Sport® Recovery? Grab trail mix that’s heavy on the fruit, for another way to eat somewhere close to a 4-to-1 ratio. Another great source of post-workout protein, beans and lentils are staple plant-based proteins. Pre-making Mason Jar Salads with lentils or garbanzo beans is a great way to be prepared for a post-workout meal on-the-go. Gluten-free, delicious and packed with 9 grams of complete protein per cup of quinoa once cooked.6 Quinoa only takes 15 minutes to cook, so it’s a great weeknight post-workout staple. Just be sure to rinse dry quinoa thoroughly before cooking, to remove any bitter taste. Roasted pumpkin seeds make a good post-run snack and contain 10 grams of protein per 1/4 cup.6 Try them in your 4-to-1 ratio trail mix. Actually, most all nuts are good for post-run recovery, because they contain protein as well as healthy fats. Healthy dietary fats help in hormone production, which is essential for runners, and bone health. Super green micro-algae chlorella is a good addition to your post-workout smoothie. Not only is it an excellent source of vitamin A—to help support your immune system, but it is also an antioxidant powerhouse.7 Free radical scavenging and quenching carotenoids are also abundant in chlorella, specifically the provitamin beta-carotene. Running elevates cortisol—the stress hormone— levels. Consuming minimally processed foods while avoiding uncomplementary stress will help to reduce cortisol levels. Additionally, there is promising evidence that getting enough amino acids, especially arginine and lysine, can help to reduce cortisol levels, while promoting healthy hormone levels.8 Sesame seeds are a good source of arginine. Add them to your post-run salad or smoothie! What is your go-to post-run meal or snack? Panahi Y, et al. (2015). Antioxidant and anti-inflammatory effects of curcuminoid-piperine combination in subjects with metabolic syndrome: A randomized controlled trial and an updated meta-analysis. Clinical Nutrition. Bernardot, Dan (2012). Advanced Sports Nutrition. Human Kinetics. 4th ed. M.G. Ferruzzi, et al. (2002). Antioxidant and Antimutagenic Activity of Dietary Chlorophyll Derivatives Determined by Radical Scavenging and Bacterial Reverse Mutagenesis Assays. Journal of Food Science 67 (7).